When I started Weight Watchers I would have never thought I could have had something like this on the plan, especially for only 14sp. 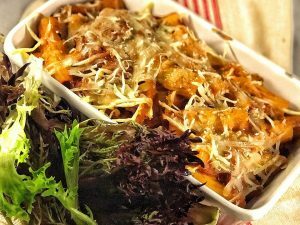 I found that cooking each portion in separate dishes (like lasagne or small pie dishes) was a great way of making sure you had the correct portion size as often my boyfriend requests a lot more than a weight watchers portion would allow! This is a quick, easy and filling meal which is perfect when your cupboards are a bit bare, the majority of the ingredients I have in my cupboards all the time! Omit the chorizo for a lower pro point option . Put pasta on to boil in lightly salted water (I used penne). Meanwhile fry your chorizo for a couple of minutes in 1KAL until the oil starts to release. Then add the chopped onion and peppers and fry until the onions are soft. Add the garlic and fry for another minute. Drain the tin of tuna and add to the pan. Season with salt and pepper and add paprika, cayenne pepper, crushed chillies and oregano and mix. Add the carton of passata, a small splash of balsamic vinegar and a drop of Tabasco sauce. Simmer for a few minutes . Meanwhile make the cheese sauce according to the instructions (add boiling water to granules in a cup and stir until thick) and add to pan. Drain the pasta and mix in with sauce. Place in a baking dish (or separate individual baking dishes) and top with light cheese. Serve with rocket salad drizzled in balsamic vinegar. 2nd recipe this week and WOW!! even better than the last. Thank you and I hope you don’t mind but I’ve shared a link to this page on our closed fb WW group. Hi Lainey, of course not, please share away 🙂 so pleased you are enjoying my recipes! Hi Jo! Do you need to use the bisto cheese sauce? Tried this yesterday, adapted slightly for the ingredients I had in but was amazing and OH commented how nice it was too so win win haha. Thank you.